You’ve heard me say it before so don’t act surprised to hear it now — I have a thing about France and particularly Marie Antoinette. I have no idea why, I just do. Now, since I’m in the confession mood, I read Melanie Clegg’s blog, Madame Guillotine, and have for a while. I’m a good lurker like that and she’s interesting and funny so I keep going back. Anyway, I saw the book there and then one day I saw it come up on my Nook and I bought it. I’m so happy I did too. 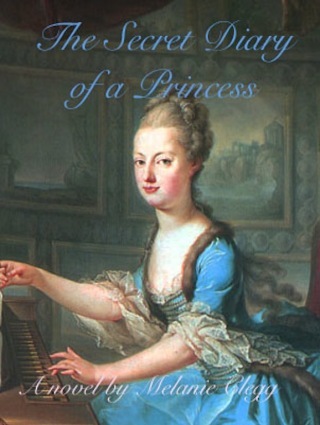 The Secret Diary of a Princess is told through the diary entries of the young Marie Antoinette starting as a child in the Viennese Court, her early education (and antics), family turmoil, and her eventual marriage. She leads a privileged life, and because she’s considered unimportant in terms of being marriageable material, she gets away with a lot. When it’s decided by her Empress mother that she will become the Dauphine of France, her life is forever changed. Gone are the jsilly games she would play, gone are the teachers who let her education lag, and in their place are new manners and etiquette to be learned and new people to impress. This book delighted me in the way it was told. It’s a young girl writing and relaying her antics and daily problems such as not being able to enjoy some of the things her older sibling are allowed to do. When her mother’s plans are announced for her future, Marie Antoinette is no longer the least important of the daughters but is now the daughter the Empress is placing a huge burden on. She begins to feel the weight of what her mother wants of her but you also see a very young, and very scared, girl. I liked that. While Marie Antoinette doesn’t change dramatically — she still has the worries of and understanding of a young girl who doesn’t see the political ramifications of her actions — you see a glimpse of the woman she’s about to become. There’s so much written about Marie Antoinette, her early life included, and while no one would say it was easy, it was certainly interesting. She is the youngest child of 15, lives a quiet and sheltered life at the Viennese court, and is then elevated to being the Queen of France. It’s an amazing story in some ways even more fascinating than anything fiction writers can imagine. I think that’s why I keep going back to books about her and this time frame. It all fascinates me so much. Anyway, back to the book. I enjoyed it and when I came to the end, I was actually sad to see there was no more. It ends in a necessary place but I wanted it to go on. The dairy of a princess must stop when she stops being a child. My only quibble, and it’s a small one, is that I never thought of Marie Antoinette as being a writer so it took me a minute to take my early thoughts out it and get lost in the story. It didn’t take long. I was too entranced by the story to care at that point. Finally, I did see that Clegg is writing a sequel to this one and I’m planning to read that one as well. I’m interested to see how she handles the next stage in this character’s life. Thank you so much for taking the time not just to read my book but also write such a lovely and well considered review! I am truly grateful and so pleased that you enjoyed The Secret Diary so much! So glad you decided to keep writing! It was a fun book and I’m looking forward to the second one. Thanks for stopping by.